My feet ache constantly. I suffer from nasty calluses and cracked heels, and that causes my feet to endure lots of pain. Especially when I’m standing up! Ow! I craved a product that would deliver promising results and actually stuck by their word. Additionally, I wanted a skin care product that is pure and gentle. Green living can be somewhat of a daunting task. Finding the best natural skin care products isn’t always kind on my budget. Susan Brown’s Baby offers relief for moms with sore feet while making sure they can spend their hard earned money on other items – like diapers and baby food! 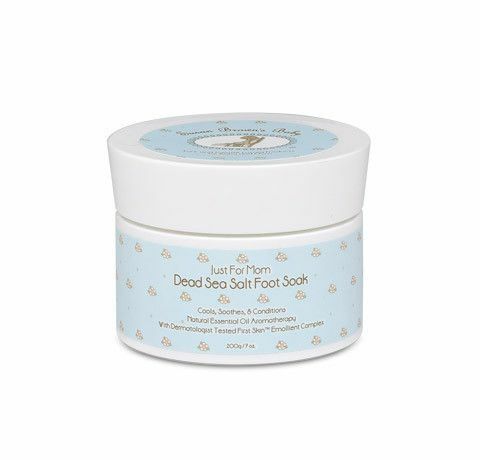 For my review, Susan Brown’s Baby sent their Just For Mom Foot Therapy Cream and Dead Sea Salt Foot Soak. My feet desperately needed moisturizing and rejuvenating! I was putting all the stops out for this! I NEEDED this to work. The Just for Mom Foot Therapy Cream and Dead Sea Salt Foot Soak were a dream [did ya like the rhyme?]. My feet felt [almost] instantly relived from the aches and pains that accumulated throughout the long day. Chasing after a 2-year old is a lot of work, but I can rest assured knowing that at the end of the day -Susan Brown’s Baby has my back…err, feet! The Foot Therapy Cream is enriched with First Skin Emollient Complex, which is a dermatologist tested array of rich botanical moisturizers. What did I like the most about these products is that they are paraben-free, vegan friendly and are NOT tested on animals. You can purchase the Just for Mom Foot Therapy Cream for $20 and the Dead Sea Salt Foot Soak for $28.75. I so need the foot soak! There are days that my feet will kill me! !